Us vs. It is a cooperative game that teaches iterative tuning and balance. The game is played in two stages. First, the players act as scientists and work together to program a giant robot. When they finish this task the robot breaks free from the lab and begins its wild rampage. In the second stage the players take the role of tank commanders, who must coordinate their attacks to stop the robot before he reaches a nearby city. Print out the pieces and the board onto heavy cardstock (I recommend 110 lb. paper) or alternatively, print them onto sticker paper and then stick the them onto cardboard. You will also need a robot token. A small plastic toy will work perfectly. Give the players a programming sheet, the robot token, 4 tanks per and a game board. The players must try to design a robot that is strong enough to get all the way across the board, but not so strong that it can cross the goal line. The group is trying to tune for dramatic tension, not for victory. Note that it is easy to make a robot that could cross the goal line on the first turn or, conversely, to make a robot that dies on the first turn. Neither of these outcomes are desirable. Instead the players should imagine they are directing a movie and are attempting to create the most exciting ending possible: the killer robot is about to step into the city when, at the last second, the final surviving tank fires a lucky shot that destroys it in a huge ball of flame. In the first stage of the game the you are scientists building a top secret weapon for the military. Fill in the actions that the robot will perform each turn. You have 10 slots, but you do not need to use them all. 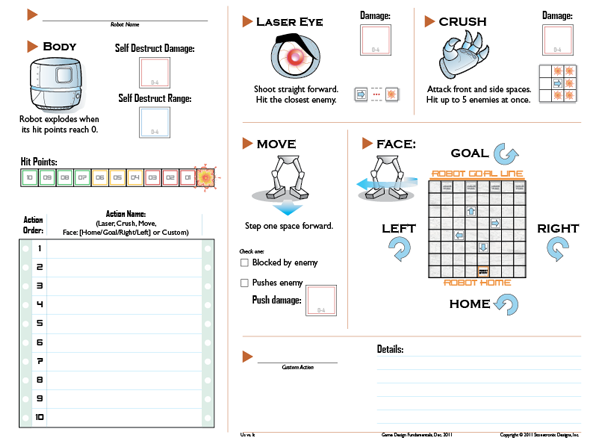 The actions are listed on the right side of the programming sheet: Laser Eye, Crush, Move and Face [Goal/Left/Right/Home]. You can use the same action multiple times and ignore actions that you don't need. For instance the action list may have the following 10 commands: Move, Move, Move, Face Right, Laser Eye, Crush, Face Left, Laser Eye, Crush, Face Goal. Finally, if you want your robot to self-destruct when he reaches 0 hit points then fill in the squares in the Body section. Laser Eye: The robot's long range weapon. The laser attacks the closest tank in a straight line out from the robot's front. It does damage equal to the number in the damage grid. Crush: The robot's close range weapon. Similar to the laser eye, but it can attack the 5 adjacent squares (3 in front and 1 on each side) simultaneously. Face: When writing this action include a facing: Goal, Left, Right or Home. When this action triggers the robot will turn his front to face the given direction. Note that "Left" and "Right" are relative to the goal line, not to the robot's current facing. Move: The robot moves forward one space. The robot cannot move into a space off the side or back of the board. If an action would cause this to happen then just skip it. If you want your robot to move more than one space per turn then you will need to specify multiple Move commands in the action list. Decide whether or not your robot will be blocked by tanks or whether it will push them, and if this causes damage. If a tank is pushed off the board then it is out of the game. If a tank is pushed into another tank then all the affected tanks will move in the same direction. If the robot steps over the goal line then the game ends and the players lose. In the second stage of the game the robot is placed in the robot start square and the tanks are placed in the tank start squares along the opposite edge of the board. The robot moves first. Continue down the action list in order, executing each action in sequence. The robot's turn ends when you get to the bottom of the action list. Now it is the tanks' turn. Each player will be in control of one tank and they can perform up to three actions a turn: shoot, move or rotate. A player can choose the same action twice (for instance, shoot at the robot twice in the same turn) but not three times. A tank cannot enter a space with another tank or with the robot. A tank can fire over top of other tanks. Every time a tank hits the robot the robot will lose 1 hit point. When it takes its tenth hit it explodes and does self-destruct damage (if applicable). Tanks caught in this final blast may be destroyed. The game ends when the robot dies. When the game ends the players win if the robot is on the last row of the board. If the robot died sooner than that then the players should reprogram the robot to make him stronger. If the robot escaped off the board then the players should weaken the robot. Keep tuning the robot's program and battling it until you find a combination of actions that provides just the right amount of power to create a climatic Hollywood ending. After you get the basics of the game, add in a super power at the bottom of the sheet. This can be anything you want, from transforming, to mine laying, to burrowing, to teleporting. Think back to all of the giant robots you have seen in movies and comic books.What made them special? Anything goes here, as long as the primary objective is met. The robot should be tuned so that it dies on the last row of the battlefield. If you have enough players then split into 2 or 4 groups and have each group work on their own robot. When all the groups have fine tuned their robots then its time for the ultimate showdown. Remove the tanks from the game and have the robots fight to the death in a closed arena. Each robot starts along a different edge of the board. You do not win by crossing the goal line; the winner is the last robot standing. Players need to modify their programs slightly in the following ways: 1) Replace all references to "tanks" with the word "robot". 2) The "Goal" is now the opposite side of the board from where your robot started. If a robot steps over its own goal line then immediately teleport it back to its starting square. Pick one robot to go first and execute its first action. Go around the table clockwise executing each other robot's first action in turn. Continue until every robot has done their 10 actions, then start over at the first action. If a robot has fewer than 10 actions then it "rests" while the other robots continue.. Despite the wildly different special powers, the battles tend to be very close, since the robots are all tuned to be approximately the same strength as four tanks.